One of the biggest challenges every teacher faces is classroom management. Your most challenging class might be a kindergarten class with many behavior challenges or it might be a Grade 5 class with attitude. In this newsletter, I’m sharing some tips that have helped me with classroom management. Structure and routine can help children learn to behave appropriately in your classes. One of the easiest ways to introduce routine is teach the children how to enter and exit your classroom and where they should sit. In my friends classroom, she assigns her students to one set of Wenger Flip Form risers. She has 5 colors, so they know which color they are on, and dismisses them or directs them to activities by color. The students with shakier behavior sit on the bottom of the riser. They have to earn the right to move to the top row of the riser. I like to sit my students on risers or on the floor. I usually have 2 boys, then 2 girls. If someone is causing issues, I’ll switch the pattern for that child to 1 boy – 1 girl. I’ve made them into posters that you can put up in your room as a bulletin board and refer to often. They are in the Teaching Aids section of our website. It’s really hard to manage classroom behaviors if you don’t know all the students names. Beat, beat, feel the beat. Say hello to those you meet. Teacher says: Hello Jason. Students echo Hello Jason. Say the names high/low, loud/quiet, fast/slow, speaking, whisper, shout, sing, sing the names using a variety of tone sets: smsm or mrdd. Don’t just use sol and mi. Name games are included in Musicplay. Maintain a quick pace in your activities, and make sure to have movement activities to use between seated activities. Engage the students – When students are engaged, they aren’t causing problems. When are students engaged? When they are “doing!” The teacher needs to remember to talk less and do more! This was one of the truisms that Lois Choksy taught, and she was so wise. If you try to talk over top of the noise level in your class, students won’t hear and you’ll lose your voice. Wait for quiet to begin. 7.Praise the Positive A pat on the back goes a lot further than a kick in the pants. Catch someone in the class doing something right and make a positive comment. It will often encourage the rest of the students to behave more responsibly. I do this when we get out instruments and sing/play Play and Stop. 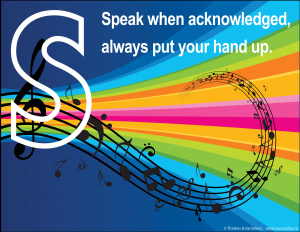 It works so well from preK – Grade 4 that I use this every time I get out instruments. When we sing “stop” I praise the first child that I see who has stopped. 8. PLUS POINTS is a way to reinforce good behavior. In PLUS POINTS, you keep a score of when the students do something well. If students do something poorly, erase a point. For example: Students enter the room quietly and go to assigned seats. I’d say, “Well done 4B – you came in quietly and found your seats. Point for you.” As the class continued, each time I’d observe them doing something well, they’d earn a point. However, if a child was talking when I was talking, erase a point. You have to decide what the magic number is before they get a class PLUS POINT. If you decide on 5 points, if a class gets to 5 points in one period, they get a PLUS point (+). On my chart with all the classes listed, I’d mark a +. When my classes reached 10 PLUS POINT days, they’d earn a game day. On the game day, (or at the end of the period in which the game day was earned), we’d brainstorm the list of games or activities that they’d like to play: singing games they really liked, Beat Boards, Orchestra Bingo, Head and Shoulders Knees and Toes (In the Hall of the Mountain King), Rhythm Dice, or Music Centers. The Game Day is a reward, but there is still great learning going on. 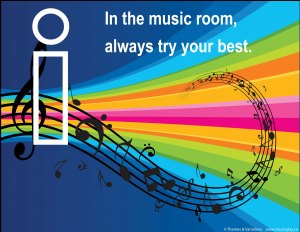 Be sure to visit www.musicplayonline.com – we’re taking the Musicplay K-6 curriculum online! While the site is under construction it’s FREE to use! (no credit card required) We’ll eventually have all the Time Out behavior reflections posted on this site. 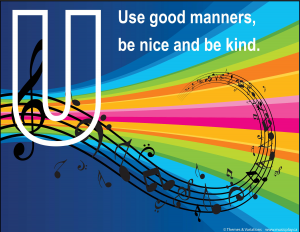 This entry was posted in Classroom Management and tagged Denise Gagne, music class management, music class rules, music classroom rules, music rules lesson plan, music rules posters, Musicplay on February 15, 2016 by Denise Gagne.